Dinosaurs on a spaceship. Cyborg gunfight in the Old West. Return of River Song. The Weeping Angels strikes again. Asylum of the Daleks. And the heartbreaking last stand of Amy Pond and Rory Williams. Brace yourself for the new season of BBC's Doctor Who with this mindblowingly awesome trailer. We all know the Eleventh Doctor is in for some unprecedented crisis for the upcoming season seven of Doctor Who, incidentally the longest-running science fiction television show in the world (according to Guinness World Records) with the return of The Weeping Angels, one of our favorite sci-fi villains ever, and an onslaught of Daleks in the season opener, "Asylum of the Daleks". 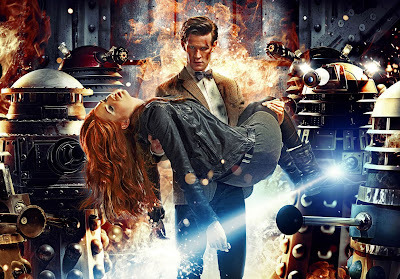 However, all these potentially world-ending disasters pale in comparison to the impending departure of the Eleventh Doctor's beloved companions, Karen Gillan's Amy Pond and Arthur Darvill's Rory Williams. For those who don't quite get the gravity of this pivotal season, BBC has released this incredible 90-second trailer giving you an awesome preview of he seventh season. Hit the jump to check out the clip. "Who killed all the Daleks?" "We'll get through this, I promise. Don't be scared." Boasts Amy, "Scared?! Who's scared? ... Geronimo!!" The image shows Amy Pond being carried by an injured, grim-faced Doctor. They’re both surrounded by Daleks that have been encountered during different eras of the Time Lord’s travels. A Dalek on the right of the picture does not have any of the vertical grille-like slats that have become a familiar feature, indicating it’s a version the Doctor faced when he first met his oldest enemies on Skaro. And on the left there’s a Special Weapons Dalek, last seen in the 1988 story, Remembrance of the Daleks. It’s a fiery and exciting sign of what’s to come in the new series! On other unrelated Doctor Who's developments, in commemoration of the series's 50th anniversary, BBC has announced that they will be releasing a 90-minute film to "tell the story of the genesis of the BBC sci-fi show in the early 1960s". Set to be aired on BBC Two next year, the film, entitled "An Adventure in Space and Time", will be written by series veteran Mark Gatiss (that's Mycroft Holmes in the amazing Sherlock TV series by BBC) with both Steven Moffat and Caroline Skinner as executive producers. 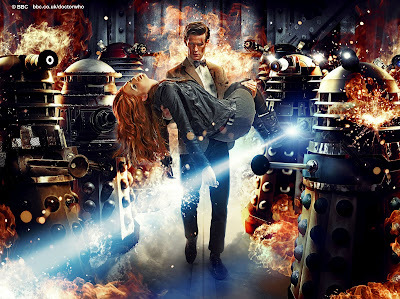 The seventh season of Doctor Who will kick off with "Asylum of the Daleks" later this month.